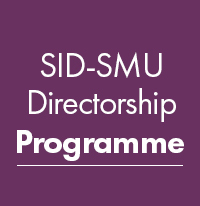 The SID-SMU Directorship Programme (SDP) was launched in 2007. It is a director training programme with a formal certification process. The partnership brings together the Singapore Management University’s academic excellence and strength in delivering executive programmes, as well as SID’s strong network of senior business executives in the corporate sector. This unique six-module programme provides a 360-degree board-level view of the key strategic areas and issues faced by company directors. It aims to enhance participants’ board level skills and update their knowledge and ability to lead in challenging times. This module supports directors in fulfilling their responsibility to enhance the longer-term financial performance of their companies. It presents practical conceptual frameworks to help address the impact on the strategy of a company from global trends (such as globalisation, technologicial change and demographic change), and how longer term growth can be achieved under changing conditions. The module also examines the role of the board vis-à-vis management in the development and executive of strategy.